Ubisoft released some information, two images and a video walkthrough for Far Cry 3‘s co-op mode. This video introduces the four co-op character and explains the story line for the co-op campaign. The campaign takes place six months before the single player campaign and stars the four players attempting to take back money stolen from them. Players will be able to customize their load outs to suit their play style. Players in co-op mode will have access to skills and abilities found in the multiplayer mode and will be required to use them to assist their team in completing their objectives. In addition, each chapter stars a small competition that will pit players against each other in a skills competition. 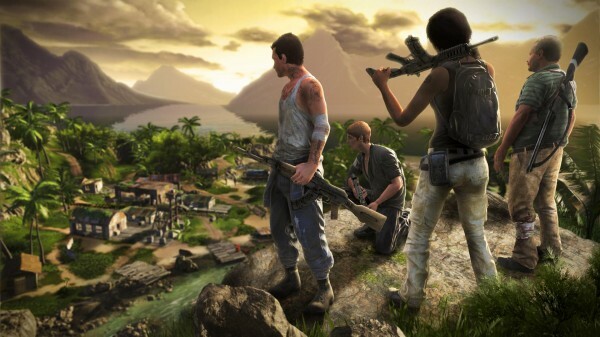 In addition, Ubisoft has released a full background on the story and characters featured in Far Cry 3’s co-op mode. When a twisted ship captain sells his black market cruise liner and everyone on it to a warlord named Hoyt, only four crewmbers have the courage to fight back. They band together to fight off the pirates and recover the safe that holds the ship’s profits and the crew’s earnings. But the captain has different plans in mind. He escapes, taking the money from the safe with him, and takes refuge on Hoyt’s island. Now, the four survivors must claw their way through the jungle to reclaim what they have lost and exact revenge against the man who wronged them. Growing up in the projects of Glasgow, Callum developed an early attachment to knives. At six, he won his first knife fight. At 12, he was already leading a street gang of his own. After years of dodging serious trouble, Callum’s ruthless spirit finally took its toll. He picked a fight with the wrong man, snapped and incidentally beat him to a pulp. Hunted by police and gang members, he fled Scotland and found a job on the SS Astrid. Callum has a cynical, black-humored point of view, but becomes aggressive, ruthless and, at times, psychotic when provoked. Leonard started out like any other cop in Philly: a good Catholic boy, following in his father’s footsteps. But as he climbed the ranks, his ethics dimmed. He planted evidence, stole from busts, and wasn’t above negotiating a favor from a hot blonde in place of a ticket. Leonard got things done, no matter what. But in the end, his loose definition of the rules cost him his gun and badge. A cop buddy pulled a few strings to land him a security gig on board the SS Astrid. In battle, he’s the top of the food chain. He fights with his gut and will use any excuse to crack a vulgar joke. In her home outside of Las Vegas, Tisha learned to take charge from an early age. Her binge-drinking mother and absent father left her the head of the household, and she’s been a leader ever since. Tisha joined the army as a combat medic straight out of high school and was respected for her aggressive and focused personality. After four tours overseas, a commanding officer with a personal grudge managed to get her diagnosed with a pre-existing personality disorder, although knocking him out might have had something to do with it. She was booted without benefits. Embittered and sick of home, she found a job on a website for remote medics on board the SS Astrid. Now that she’s back in the fight, she finds herself more suited to guns than needles and ruthlessly takes on the enemy face-to-face without hesitation. As a street orphan in St. Petersburg, Mikhail’s youth was marked with abuse and abandonment. It wasn’t until his teenage years that he found his path and fell in with in with an elite league of criminals, known for its strict code of conduct that extolled honor and resistance against authority. After two stints in jail and years of devotion, he was crowned a leader of his gang and became the right-hand man to his mentor. But when he fell in love and eloped, breaking his league’s code, he was forced to flee and put his wife, Katya, and newborn daughter into hiding. Now he’s working aboard the SS Astrid to earn what money he can to start a new life outside of Russia. Always one step ahead, he’s calm and collected in battle. His mercy extends to no one. Far Cry 3 is slated November 29th 2012 in Europe, Australia, and New Zealand, November 30th in the UK, and December 4th in North America.